The US is engaged in rather dubious activities as it attempts to damage the Russia’s economy by making fall down the world oil prices. The United States has taken over as the largest oil producer in the world together with the Organization of the Petroleum Exporting Countries and Russia. The new technology of fracking is more expensive than extracting oil by conventional methods, and it’s not profitable with the prices sliding down below 60-70 dollars a barrel. The fall of oil prices brings down the cost of companies shares. In three months the share prices of companies known to be driving vehicles of «energy revolution» have slid down by 40% on average. The leaders such as Apache Corp (APA), ConocoPhillips (COP), EnerJex Resources Inc. (ENRJ), Marathon Oil (MRO), Continental (CLR), Noble Energy (NBL), Southwestern Energy (SWN), Anadarko (APC), Pioneer Natural Resources (PXD) have their share prices dropped by 30-50% in comparison with the maximum reached in mid-2014. The process continues. Stock price dynamics resemble deflated bubbles. Plunging oil prices sparked a drop of almost 40 percent in new well permits issued across the United States in November in comparison with October. The pullback was a «very quick response» to US crude prices, said Allen Gilmer, chief executive officer of Drilling Info Inc. Offshore drilling is also being affected. Transocean, the owner of the biggest fleet of deep water drilling rigs, recently took a $2.76 billion charge among a drilling rig glut. The Washington’s policy aimed at bringing down oil prices may negatively affect the US economy turning the process into an irreversible trend. 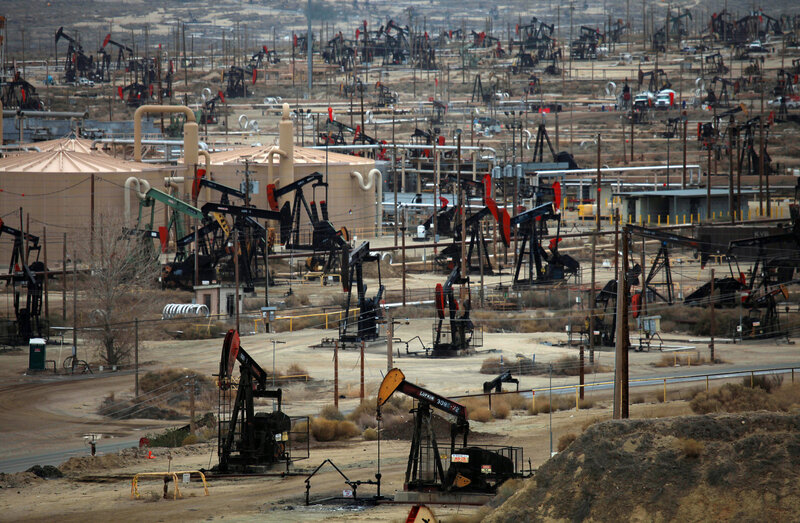 The drop limits the access of US energy companies to capital markets. Since early 2010 energy producers have raised $550 billion of new bonds and loans as the Federal Reserve held borrowing costs near zero, according to Deutsche Bank AG. With oil prices plunging investors are questioning the ability of some junk bonds issuers to meet their debt obligations. There is a vicious circle. Lower profitability reduces a company’s capitalization making it sell away assets to avoid bankruptcy. It causes the further loss of assets with shares trading going down and, subsequently, the result is the failure to pay off loans as the value of assets is reduced. The International Energy Agency (IEA) and Organization of Petroleum Exporting Countries (OPEC) energy outlooks for 2015 predict the lowest oil consumption demand in recent 12 years. The news sent stocks into a nosedive leading to the erosion of $1 trillion in market capitalization from global markets in a week. A surge in energy company failures really worries Wall Street experts. It could ripple through the financial system and wallop the banks. «There’s ‘no question’ that for energy companies with a riskier debt profile the high-yield debt market «is essentially shut down at this stage», and there are signs that further pain could hit the sector, «says Senior fixed-income strategist at U.S. Bank Wealth Management, Dan Heckman. He adds, «We are getting to the point that it is becoming very concerning». His opinion is shared by Jacques Sapir, head of the Centre d’Etude des Modfes d’ Industriaization (CEMI-EHESS), who told Europe 1 that «The fall of oil prices could have serious consequences for shale gas extraction, liquid fuel from carbonaceous shales and so-called tar sands. Today the production is not profitable anymore. The producers have received large loans form American banks. The situation creates conditions for US banking sector collapse». As a result, it will hit pension funds, private investors and the banks holding junk bonds - risky investments that have the potential to turn a high yield - causing a ripper effect across the whole financial system to make inevitable the repetition of 2008-2009 crisis. According to The Prudent Bear, «Energy-sector bankruptcies – many of which will result in production capacity being taken out of the market – and the accompanying outsourcing of energy-intensive manufacturing capacity are likely to cause damage that far outweighs any benefit from increased consumption. Capital destruction through bankruptcy reduces the wealth of society, which reduces the amount of capital available for each worker. In its turn it will reduce the long-term living standards of the workers themselves (and indeed their ability to consume). Additional consumption, much of which will be spent on imports, brings no benefit that is even close to the same level of importance». The shale energy production has created new working places. Oil states have added 1.36 million jobs since December 2007 while non-shale states have lost 424,000 jobs. Concentrated on hurting Russia Americans fail to see what’s happening in their own backyard. 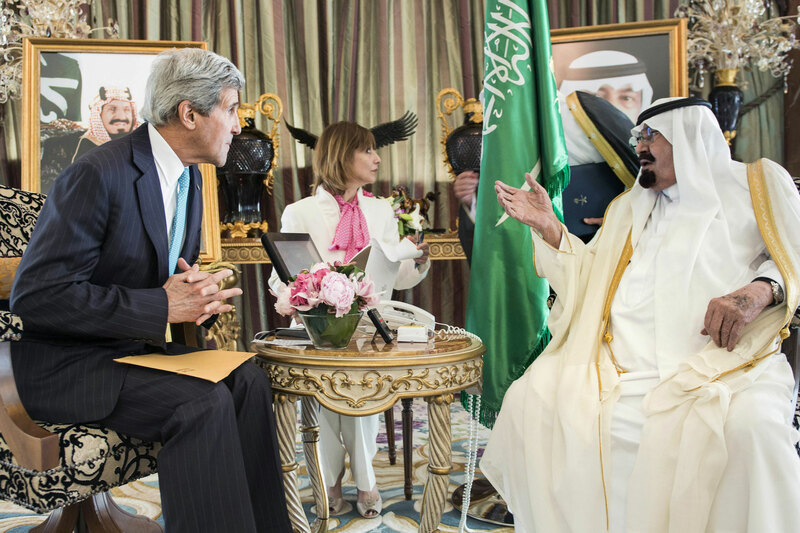 On November 9, the Guardian wrote, (4) «John Kerry, the US secretary of state, allegedly struck a deal with King Abdullah in September under which the Saudis would sell crude at below the prevailing market price. That would help explain why the price has been falling at a time when, given the turmoil in Iraq and Syria caused by Islamic State, it would normally have been rising». The collusion is aimed at weakening Russia and striking Iran. Saudi Arabia needs the price to be above $90 a barrel to balance the books. But a bit of pain is acceptable. The Saudis are gambling that they can live with a lower oil price for longer than the Russians and the Iranians can, and that therefore the operation will be relatively short-lived. But thus far, it has not affected the foreign policy of neither Russia nor Iran. Looks like the Persian Gulf states appear to suffer most. The production cost is the lowest in Saudi Arabia, but the things are much worse for its partners. The OPEC forecast of December 21 says the situation on oil market is going to take a different turn and make the «black gold» prices go up again. Evidently the statements made by oil producers are filled with exasperation. Saudi Arabia, the world’s top petroleum exporter, said on December 21 that it would not cut output to prop up oil markets even if nations outside OPEC did so, in one of the strongest signals that it planned to ride out the market’s biggest slump in years. Speaking at an energy conference in Abu Dhabi, Saudi Oil Minister Ali al-Naimi blamed a lack of coordination from producers outside the Organization of the Petroleum Exporting Countries – along with speculators and misleading information – for the slump. He said, «Saudi Arabia with OPEC countries tried to restore the balance in the market, but the lack of cooperation from countries outside OPEC in addition to the speculators and the spread of incorrect information, led to the fall of prices». The oil minister for the United Arab Emirates, Suhail Mohamed Faraj Al Mazrouei put it even more bluntly stating that one of the biggest reasons that led to the deterioration in prices is the irresponsible oil production by some non-member bodies, some of which are new to the oil market. Evidently he refers to the United States responsible for boosting shale oil supplies in recent years. There is ground to believe that while openly supporting the United States Saudi Arabia plays its own game aimed at squeezing the competitors away, including America, from the market. Some time ago Riyadh used to say that OPEC members will not cut production even if the price plunges to $40 dollars a barrel. With oil prices plummeting traditional oil producers have enough reserves to make it through a period of frugality while the US shale industry will be delivered a deadly blow to make it never bounce back. The negative economic trends are already visible in the US while Russia has not even started to take counter measures as the economic war unleashed against it is raging on. There is a broad range of options open for Russia. Being carried away by fluctuations of Russian currency the United States does not pay attention on such things as the drop of prices on its stock exchange or the ambiguous policy of its allies. Here one cannot but agree with the assessments of Marin Katusa, Chief Energy Investment Strategist, who says that «It is true that sanctions could make it harder for Russian firms to access Western know-how, and ultimately affect Russia’s oil output. But that’s only if they drag on for years – which is doubtful, given the price the EU is already paying. A cut in global oil supply – and stronger global growth – will likely rebalance the oil market in the meantime». The Russian oil buyers can pay in gold, they need no greenbacks. No need to explain what is in store for the US dollar in case they do. The Russian oil producers get dollars for their exports while paying taxes in rubles. It means no abrupt fall in taxes revenues is imminent in Russia. The Russian Federation can also switch to using rubles in its oil trade settlements to depreciate the US dollar while boosting the global demand for its national currency.